The tenth trilateral meeting of the foreign ministers of Greece, Bulgaria and Romania showed the capability of these three countries to speak with a common voice and the knack for every one of them to announce or receive support for its key initiatives. Such trilateral and quadrilateral formats (together with Serbia) have been backing regional cooperation and infestructural interconnectivity for the last few years. This time, just like before, there were no announcement of concrete data for provided expenditures or for terms, within which certain projects will be completed. However, the talks are an apparent step on the road towards few forthcoming diplomatic events. One of them is the Western Balkans summit, which will take place on 17 May 2018 in Sofia. The other one is the summit of presidents of Bulgaria, Romania, Austria and Estonia in Rousse, which is planned for the beginning of May 2018. Its focus will have to be the Danubean strategy. Surely, in the list with forthcoming activities have to enter also the three countries` efforts to realise natural gas transmission projects, and the forthcoming Romanian presidency of the EU in the first six months of 2019. The three foreign minisiters – the Bulgarian Ekaterina Zaharieva, the Romanian Teodor Meleşcanu and the Greek Nikos Kotzias have found common grounds on many international relations issues. They supported the open door policy towards new members of the EU and NATO from the Western Balkans. With regard to the countries of the Eastern Parntershi (the former six Soviet republics: Belarus, Ucraine, Moldova, Georgia, Armenia and Azerbaijan), the three foreign ministers asked for „strong connections“ between the countries-object of the partnership and the EU. As far as the future of EU is concerned, the three diplomats are convinced that the cohesion policy and the common agricultural policy sould remain the main pillars of the European budget architecture. As it got clear at the press conference, the three of them don`t accept the idea that the amount of cohesion funds for every member-state to depend on the progress in realisation of the rule of law in it. Romania and Bulgaria continue to be under the Mechanism for Cooperation and Verification in the sphere of justice (Sofia is also observed for organised crime). There is not way both countries would accept to have reduced eurofunds, because of poor marks in the anti-corruption fight. According to the Greek foreign minister the funds issue is directly connected with the question „What Europe do we want?“ – if we want „more Europe“, we have to increase the funds, but if we aim at „less Europe“, it is logical to reduce them. On another important European issue – the free movement of people, the three countries have declared in a common voice that Sofia and Bucharest`s place is in the Schengen area. These positions have been affirme many times and certainly will continue to reverberate in the confernce halls of the three countries` foreign ministries. It is more interesting how any one of the states managed to affirm its views in the joint declaration and in the discussions. Signs for Romanian-Bulgarian reciprocal interest could be sensed in Meleşcanu`s and Zaharieva`s affirmations. “I would like to salute the Bulgarian presidency’s intention to promote our region on European level during the six months in which it conducts the Council of the EU. We will focus on the connection between the Danube and the Black Sea. Our fundamental idea is to support the macroregional strategy of the Danube region, which is to be financed by the EU”, said the Romanian foreign minister. He made a connection between he Danubean and the Black Sea region in his speech, but limited his vision for macroregional cooperation only to the Danube. Thus Meleşcanu made an important statement before the summit in Rousse, which is going to look for additional European money for projects in the Danube region. In an interview with Baricada in February 2018 the former Bulgarian ambassador to Romania Valentin Radomirski stated the Bulgarian interest with regard to the Danube strategy: “At the meeting in Rousse three countries which are going to hold successive EU Council presidency in the next 18 months will participate. This allows for taking measures for the renewal of the Danubian Strategy itself and most of all, for reducing the discrepancy in the economic and infrastructural development of Upper and Middle Danube and the development of its lower part, where Bulgaria is situated.” Romania is in the same geographical space and it is logical to have similar interests. But Meleşcanu`s statements only marked the Romanian desire for macroregional approach towards the Danube region, without additional details. In her tur, Ekaterina Zaharieva pointed out that with regard to the Danube strategy the Bulgarian presidency of the EU is focused on culture, tourism, and the connectivity between the Danube and the Black Sea. „We have discussed it many times on European level whether there must be speical funds for regional strategies such as the Danube one. 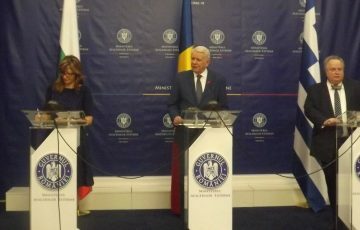 Whether the lack of specially assigned money for these stategies doesn`t lead to slower development… During our presidency, but especially during the Romanian one, I believe it will be best to discuss the topic again, taking into consideration the future financial framework“, stated Zaharieva. The Bulgarian ministry of foreign affairs put an emphasis in a press release about the meeting that according to the joint declaration „the three parties express their readiness to work on the development of the gas hub „Balkan“, which will contribute to the security of deliveries and to the diversification of the gas routes and sources“. The three countries also expressed their support for the construction of the interconnectors between Greece and Bulgaria, Romania and Bulgaria, of the so-called vertical gas corridor, which is to link them, for the gas pipeline Bulgaria-Romania-Hungary-Austria, and for the comprehensive vision for gas transmission connectivity in Central and South-East Europe, which was discussed for the last time in Bucharest at the level of ministers in September 2017. The joint declaration states support for the development of alternative sources of natural gas – Greek LNG terminals, the South Gas Corridor (that links the Caspian region via Turkey with South-East Europe) and the Black Sea offshore resources. In its reporting on the meeting, Bulgarian media put an emphasis on the topic for the new bridge above Danube at Rousse-Giurgiu, but in fact nothing new was said about the infrastructural connections between Romania and Bulgaria. The Romanian foreign inister Teodor Meleşcanu announced that probably in less than a month there will be a quadrilateral summit (Bulgaria, Romania, Serbia and Greeece), which will discuss namely the cross-border interconnectivity in the region. Greece also included in the joint document texts that favour it: „NATO’s participation in the international efforts concerning the refugee and migrant crisis is a positive step. We express our support for the important contribution that NATO is making in the Aegean Sea by helping saving lives, curbing illegal and dangerous human trafficking and disrupting the business model of the human traffic in this area, having also a deterrent effect.“ It is more than clear who is deterre in the Aegian Sea by NATO – Turkey, which arrested two Greek soldiers that have appeared in its territory in the beginning of March. Ankara accused them of military espionage, while the soldiers claimed that they have been lost, while doing their job of guarding the border on the Greek side. A few days before the tilateral meeting in Bucharest the Greek defense minister Panos Kamenos was also in the Romanian capital. He asked his hosts to help with the liberation of the soldiers, as he declared them „hostages“. There was an echo from this case at the press conference of the tree foreign ministers. Asked by a Greek journalist, Ekaterina Zaharieva answered that Turkey was not discussed at the talks, because it doesn`t belong to the Western Balkans. The Greek foreign minister said that there must be introduced a new requirement for joining the EU – the candidate to conduct peacecful and non-agressive foreign policy, to apply the international law and the international sea law. „It is up to Turkey itself whether it will stop violating international law, the Law of the Sea and the rules of peaceful foreign policy. My other comments aren’t for this meeting“, were the final words of the press conference, articulated by Nikos Kotzias. It is worth remembering that in the last period in the vicinity of the trio Romania-Bulgaria-Greece another trio – Turkey-Iran-Russia, was formed. The first trio acts as an local subcontractor of the EU with regard to the Western Balkans, while the second one was created most of all to coordinate joint activities in Syria. The first trio has mostly eceonomic interests, while the second one pursues military goals. There is at least one more difference between the two trios – the first one still doesn`t overcome the level of joint declaration, so that it could finally reach the implementation of real project. It is certainly due to the fact that the success of the first trio is to a greater extern a function of Western countries` will. The second trio consists of countries in difficult relations with the USA, the EU or both geopolitical players.. But it seems „to achieve“ its goals for the the time being – e.g. in Syria. When the time will come for the South-East European trio to report financial and material successes? The trilateral meeting in Bucharest seems to be a succesive step in this diferction, but in order to grab it, the three countries need to be understod by their Western parners. 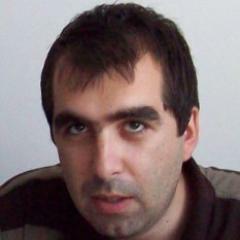 As the Bulgarian diplomat Zdravko Popov says – these partners view Romania and Bulgaria together with the Western Balkans in as part of the fourth, the slowedt European speed. The two summits – in Sofia and Rousse in May, in combination with the quadrilateral format (Romania, Bulgaria, Greece and Serbia) in Bucharest are the events, which we must follow.